George Clooney is a pretty classy guy, the Cary Grant of our generation, if you ignore the fact that he’s an outspoken liberal quick to take a jab at the current administration. As an actor, he’s top notch; I thought he was hilarious in O Brother Where Art Thou, and as a director, he’s just as skilled. I may not agree with his political mind set, but I can’t deny the man has talent. I haven’t seen most movies he’s in, however.Syrianna, for example, the movie for which he won the Oscar, was written by the guy who wrote Traffic, and I found that script so disturbing and corrosive that I couldn’t muster the courage to sit through Syrianna for fear of experiencing the same haunting yuckiness. In any event, Clooney is quite the director. 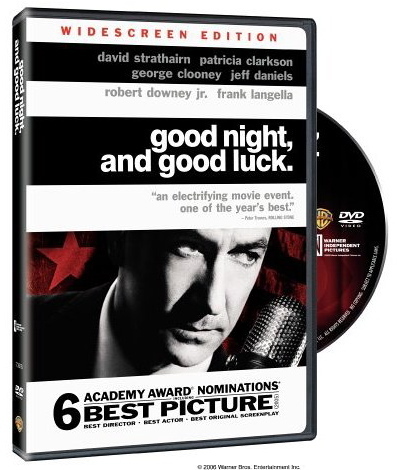 Good Night and Good Luck, which chronicles the Ed Murrow/Joseph McCarthy standoff in the sixties, is done seemingly honestly with a nice mix of cinema verite, documentary-esque camera work and real footage of McCarthy at his worst. David Strathairn, who’ve I’ve admired ever since Sneakers was fabulous as Murrows, even though I have no idea how Murrows REALLY spoke or acted; he was long before my time. I just get the sense that Strathairn was right on, from the pattern and music of his voice to that cocked, cigarette-in-finger expression. You can’t make that up. It had to come from somewhere. The fact that he was nominated for Oscar didn’t hurt my analysis either. I suppose Clooney considers himself an Ed Murrows of sorts. A buck-the-system truth seeker of our time. Maybe this film was nothing more than a vanity project. (Clooney has done the rounds many times in Washington asking questions and making statements before Congress. His campaigning for action in Darfur, for instance, seems both sensible and good.) But I doubt Clooney is being narcissistic. I think Clooney simply respects Murrows and believes that there are similarities between McCarthy and Bush, which frankly I don’t see. But, hey, this is America. We’re allowed to say what we want. What is clear is that McCarthy was a very naughty dude. If everything I learned about him in this film is true, Clooney is right to put Murrows on a pedestal. Those were dark times, and Murrows had the guts and gumption to draw a line in the sand and say enough is enough. As for the screenplay, I thought it snappy, well paced and smoothly written. I liked how it included the intriguing people in Murrows immediate circle — from his producer to a fellow and fragile CBS anchor to a man and woman working at CBS who were secretly married to the real McCarthy himself. Using the footage of McCarthy was a stroke of genius. Nothing is more disturbing than the truth, sometimes, and to watch McCarthy throw false accusations as if they were stainless steel fact was a frightening look into our recent history. The man was a power hungry zealot, and Clooney was smart to let us see McCarthy in the raw. Had an actor portrayed him, I wouldn’t have believed such things were true. I would have assumed that Clooney was being unfair to McCarthy and dictating a biased performance. Not so. McCarthy was a snake. That he could evoke such a following for awhile is unsettling indeed. All in all I thought the movie wonderful, though the Truman (or was that Eisenhower?) quote at the end was an annoying poke at Bush. It bothered me not because it was obviously a stab at Bush but because it came from out of nowhere. It didn’t belong with the story. It was clearly Clooney making a political statement. And as such, it felt like a departure from the world the film had created, a breaking of the fourth wall. Tsk tsk, Mr. Clooney. You stood atop your soap box for two beats too long. Otherwise, a wonderful flick.